Leica Monovid monoculars are available in black metal with black or red leather armoring, and silver-look metal with black leather armoring. All are 8x20 and have an included add-on lens that allows focusing down to 25cm (9.8"). They are submersible to 16.5' (5m). 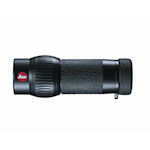 Leica Monovid 8x20 are high-end monoculars that can be used as a mini-telescope, half a binocular, or a macroscope. Featuring high-grade roof prism, AquaDura lens coatings, and complete fog- and waterproofing, Monovid monoculars are monoculars built to Leica's exacting standards.